Dual HF Excitement RF Direct Sampling Evolution. Achieves to 110 dB* (typical) of RMDRThe RF direct sampling system directly converts the analog sig-nals to digital signals, and collectively puts the data through FPGA (Field Programmable Gate Array) processing. The master clock uses a high precision oscillator which excels in low-noise characteristics. This makes it possible to provide superior receive and transmit performance, extremely low phase noise as well as high RMDR (Reciprocal Mixing Dynamic Range). * At 2 kHz frequency separation. The sub receiver works independently of the main receiver. The dual receiver is perfect to simultaneously monitor two bands and two modes. Independent AF/RF knobs for the main and sub bands improve usability. Both main and sub receivers are equipped with DIGI-SEL (digital preselector) units. The DIGI-SEL has steeper skirt characteristics than normal bandpass filters, so it rejects out of band strong interference such as broadcast stations, and prevents cross modulation. The large 7-inch color display shows various operating and setting information at a glance in high resolution (800 × 480 pixels). The combination of the touch screen and the multi-function control knob offers smooth, intuitive and speedy operation. Supplied with: handheld microphone HM-219, DC power cable, spare fuses, plugs and manual. A 2.5m long antenna element for mobile operation with the AH-4. All bands between 7–54 MHz can be matched. **Equipment subject to rules of use "general authorization", arts. 104 paragraph 1 and 135 paragraphs 1,2,3 Electronic Communications Code of DL 01.08.2003 No. 259. 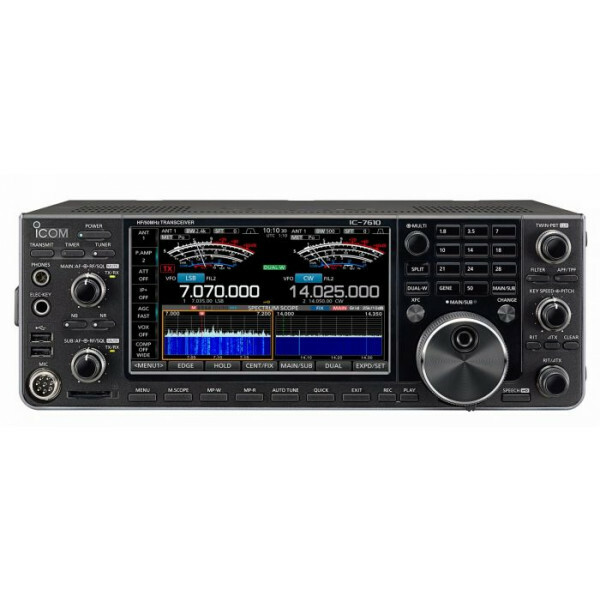 The apparatus should be used on national territory only in the frequency bands allocated by the National Allocation Plan in force at the service of amateur radio frequencies.